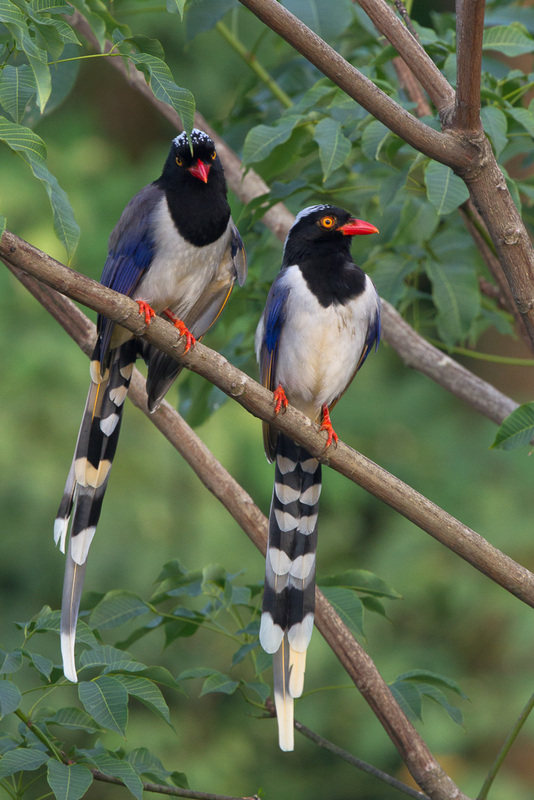 The Red-billed Blue Magpie (Urocissa erythrorhyncha) is a striking looking magpie species. As the name suggest, it has a red bill and also red legs. It’s head, neck and breast are black with a bluish spotting on the crown. 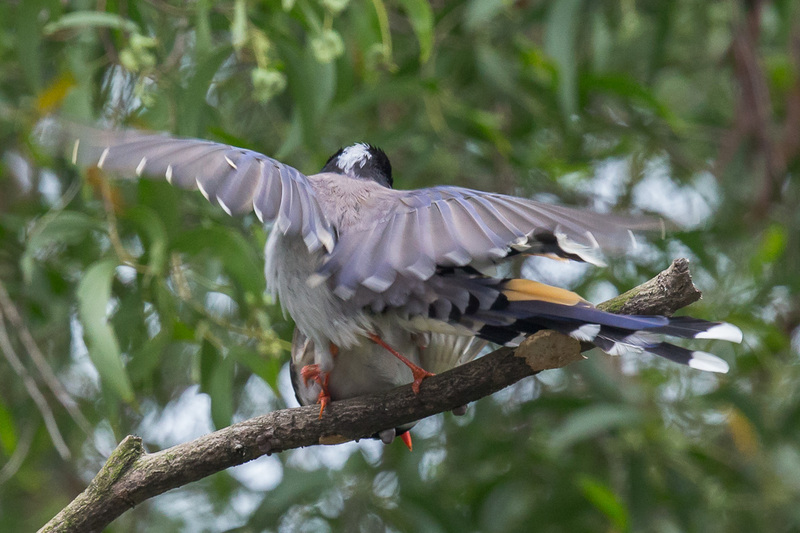 It’s shoulders and rump are a duller blue and the underparts are a greyish cream. The long tail is a brighter blue. It’s usual range cover northern India, the Himalayas, northern parts of South East Asia up to China. It’s presence in Singapore has been reported dating back to at least 2001 (wildbirdSingapore)1. 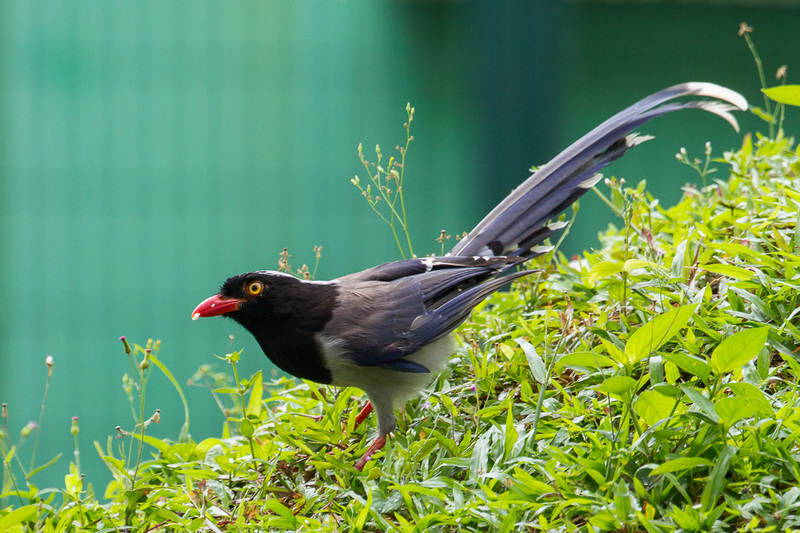 Reports of sightings have been concentrated mainly in the Southern Ridges, covering anywhere from Mount Faber to Kent Ridge Park and adjacent areas. Whatever the case of their origin, the magpies have been around for more than a dozen years with regular sightings ever since with individual sightings of 9-10 birds reported. Have they established a feral population or are the sightings of original released/escaped birds? No one can be certain, as magpies in general can live up to a decade, and breeding records are not available. What we do know is that these magpies have been mating. This have been observed in April 2013 in the below photographs. 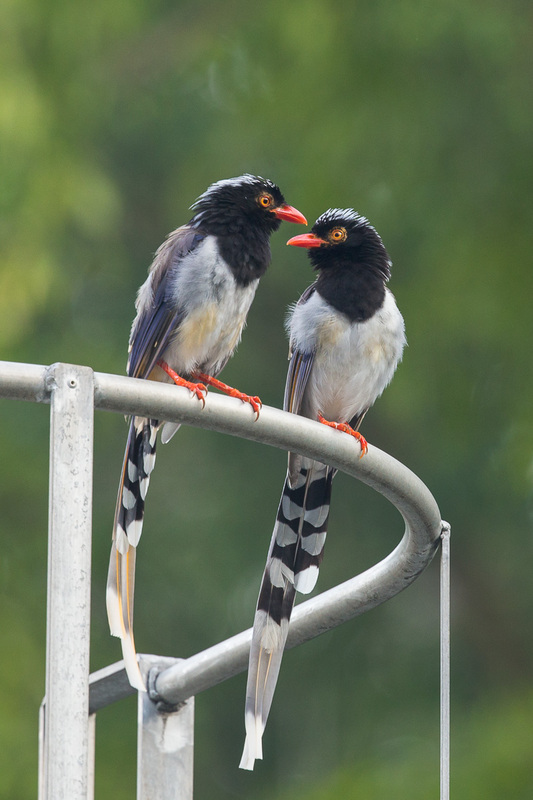 Notice the position of the male’s legs. One is wedged on the female’s leg to prevent her from jumping off. The other is holding on to the wings of the female to prevent flying. 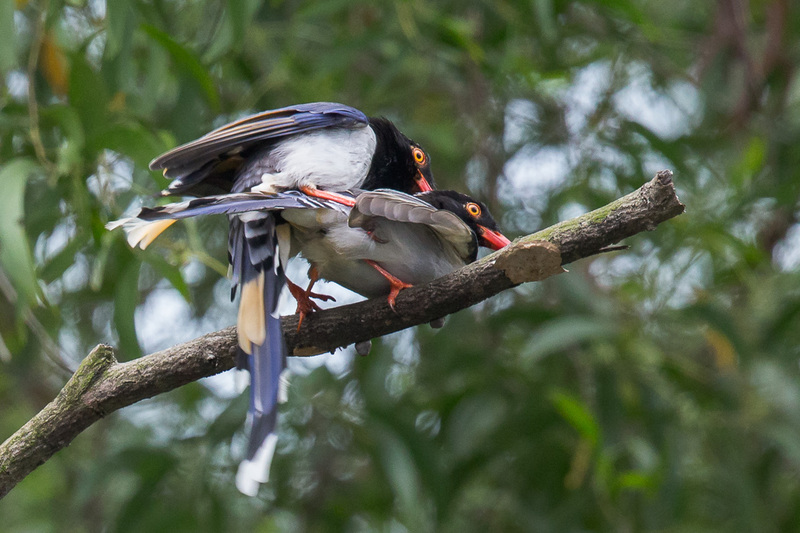 The actual act, like most other birds mating is brief and vigorous. No further observations of the fate of these birds as they tend to roam around. No nesting records are known. So what is their diet? The partial answer is that sometimes they visit nearby buildings to rummage through the nearby garbage collection points. Here it is observed eating cooked rice grains from one such building. What we can conclude is that there magpies are roaming around the Southern Ridges, are adaptable enough to be around for more than a decade, have managed to adapt at least some parts of their diet to reflect their urban settings. Most of the pictures taken here are from my office building which is opposite Kent Ridge Park over a period of 3 years. And in most of the sighting, they come in pairs or in groups. I leave you with some more pictures of these magnificent, hardy birds. Video taken handheld and stabilized in post. Please pardon the jerkiness. 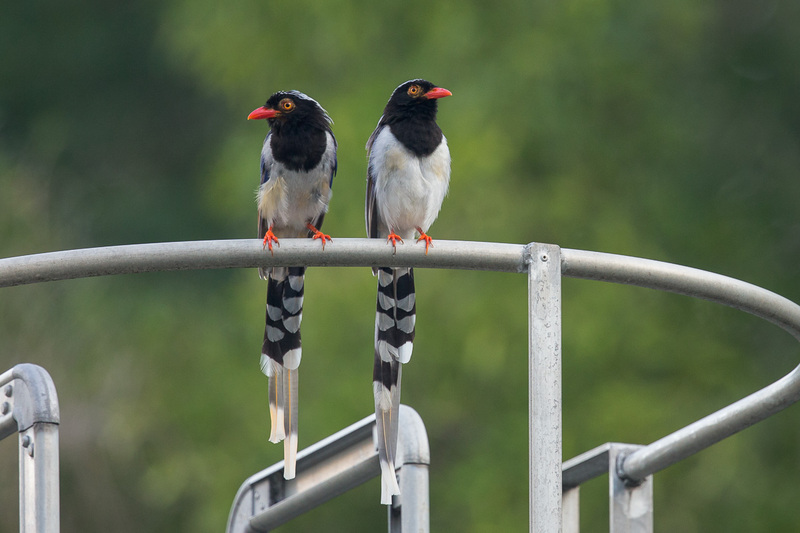 This entry was posted in Birds, Wildlife and tagged Escapee, Feeding, Kent Ridge Park, Mating, Mount Faber, Science Park II, Southern Ridges on May 27, 2014 by Francis Yap.